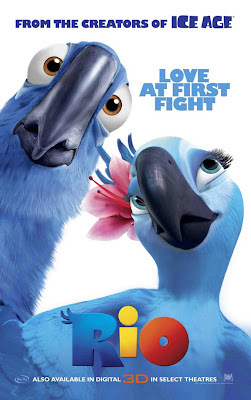 In Home Viewings - "Rio"
After being illegally smuggled from his native Brazil, Blu (Jesse Eisenberg), a rare species of bird, spends the next 15 years of his life living peacefully (and safely) with his owner, Linda (Leslie Mann). Things change, however, when a bird expert shows up on Linda's door and tells her that Blu is one of only two remaining members of his species and the little bird is needed to repopulate the wild. Blu and Linda travel to Rio de Janeiro where Blu meets Jewel (Anne Hathaway), the last female, and the mating process gets underway...until Jewel breaks out of the holding cell and gets them both captured by more illegal bird smugglers. While Linda searches for her lost pet, Blu and Jewel must work together to both secure their freedom and help Blu face his fear of flying. If that plot summary made Rio sound in the least exciting then I apologize for misleading you. It isn't. It's quite boring, really. In the entire 96 minute run time, almost nothing of real interest happens save for a handful of musical numbers that quickly become repetitive. It's a colorful, lively-looking film which is a shame given how dull it turns out to be. Blu and Jewel hop from one dangerous encounter to another but much like the music, these detours seem to be somewhat redundant. I get that illegal animal smuggling is an issue but how often can one little bird fall into the wrong hands before we start to wonder if every Brazilian is, in fact, a smuggler? With the vivid landscape Rio had to work with, I expected the plot to pop a little more rather than moving in a continual circle. In addition, the voice talent, while palpable, is somewhat misused. Perhaps this is a personal issue as I find both Eisenberg and Hathaway to be off-putting but Blu and Jewel came across as too whiny for my liking. It's almost a given that the audience roots for the main characters within a kid's movie; that's just the way these films work. But I found myself struggling to care whether or not Blu got home and the supporting characters (voiced by Will.i.am, Tracy Morgan, and Jamie Foxx, among others) seem uninspired. Like the movie itself, the actors are going through the motions. There's also no real heart in Rio and that pushes it away from being a decent-enough kid's movie into the realm of near uselessness. Beyond the bright colors and the occasional song, I can't imagine there's much within Rio to really keep a kid's attention and that goes double for adults.